“How exciting, Glugar! Grandpa and grandma invited me to go on vacation with them to an island in the Caribbean. We’re going on a plane! And we’re leaving in two days!” Clara was so happy. “Flying, the sun, the ocean, swimming…” Clara started to daydream. “Am I going too?” Glugar, her diabetes, complained. “What do we have to do?” Glugar was confused. “The doctor told me that since I live with you I have to plan carefully if I go on a trip away from home,” Clara said while writing a list. “Oooh…that’s a lot of thinking and work, and I don’t like it!” Glugar grumble, but Clara didn’t pay her any attention. Clara packed all her diabetes medications and supplies in a small suitcase that she was going to carry with her on the plane, and she also packed extras in the event that they decided to stay longer on the island. She put some snacks and her glucose tablets in her backpack. “You never now if I’ll get very hungry, or need to treat Glugar on the trip.” Clara knew how naughty Glugar could be. She asked her doctor for a traveling letter to take, just in case airport inspectors would wonder about all the stuff she was taking for Glugar. She also decided to wear on the trip—and for the first time—the diabetes id bracelet that her parents gave her as a present. ”Who knows, this might turn out to be useful…not that I like it very much!” Clara reflected. “Clara, the suitcases didn’t arrive,” grandmother said in distress. “No, this cannot be! What am I going to do? 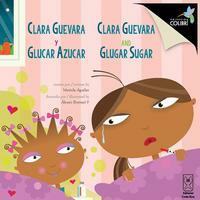 Whaaaaaa!” Glugar burst into tears. Then, panic came over her and she went mad inside Clara’s body. “Oh dear…this diabetes of yours is crazy!” grandma noted. “Well, that’s my nature!” Glugar was not ashamed of her attitude, but at least she relaxed. “Hey, the staff from the airline just told me that our suitcases will arrive in their next flight here. They’ll take them to our hotel!” grandpa joyfully approached them. “Hooray! Let’s get going then,” grandma smiled. “Uh Oh…Glugar, what are you doing now?” she asked her diabetes. “I’m so excited to be here that I can’t control myself, Clara. I think I have become a different diabetes in this island!” Glugar couldn’t contain herself. “Oh, Clara, I’m so glad you’re such a planner! It definitely pays off! It’s nice that I don’t have to worry ‘bout a thing!” Glugar was so carefree. “Thanks, and good for me too since I better be that way if I want to live well with you. But please, stop talking now and let’s enjoy our vacation!” Clara felt so proud of herself.